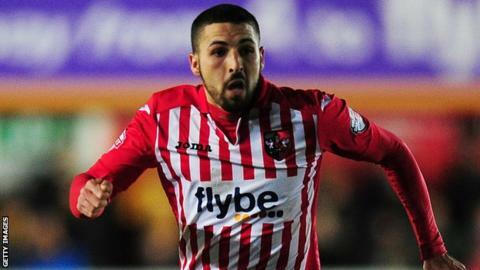 Oxford United have signed midfielder Liam Sercombe on a two-year deal following the expiry of his contract at Exeter City. Sercombe, 25, made 263 appearances for his hometown club Exeter since joining as a trainee in 2007. He was also part of the Exeter side promoted from League Two in 2009 and played 41 times last season. "He has a lot of experience at 25 and we think he will be a major asset," said manager Michael Appleton. Sercombe told BBC Radio Oxford: "It was time for me to leave and the right club has come about. I can't wait to get started at Oxford. "I went and met the manager and the chief executive. Everyone knows how big the club is and I want to be part of helping them get out of League Two, hopefully we can do that next year. "There was interest from a few other clubs but the way Oxford are planning I wanted to be part of that. I'm glad it's all over the line." Sercombe is Oxford's second signing in two days, following forward Kemar Roofe's move from West Brom. Our Tune: Kevin & Andrew - could they ever get back together? Read more on Our Tune: Kevin & Andrew - could they ever get back together?